Most fundamentally the problem was the Red Army had expanded faster than it could be properly trained. Therefore on the eve of the German invasion the Soviet Union indeed fielded more than 15 thousand combat aircraft of which 7,133 in the west. Of these, however, only 6,214 were air worthy, which was just as good because there were only 5,937 trained flight crews available to fly them. What is more only a minority of the crews were fully trained. Over two thirds of the crews were capable of flying only in average daytime conditions, but not in bad weather or at night. Finally only 208 crews had been trained to fly new model aircraft, which was seven times less than the number of these modern planes fielded in the west. It was one thing to churn out weaponry, but quite another to train the mechanics, the operators and the officers to be able to employ them on the battlefield them to their full potential. Despite the wishes of the Communist radicals to the contrary the training of men could not be rushed in the manner of industrial output. 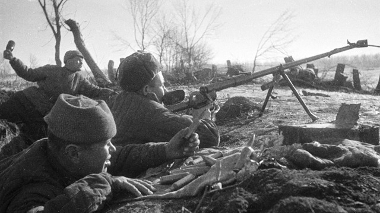 On the eve of the war the Red Army infantry still had just 79% of its prescribed number of officers. As shocking as this number is it actually downplays the seriousness of the leadership deficit in the Soviet military. Given the pace of the expansion of the Red Army before the war — it went from fielding 98 divisions in 1938 to 303 in mid 1941 — the advancement of many of its officers had been meteoric. Consequently colonels who did not even have much experience leading battalions lead regiments and majors who had only a short while ago been mere lieutenants in charge of platoons led battalions. Meanwhile numerous platoons were led by junior lieutenants — conscripts who had been given a brief officer training course that sometimes took only three months. Not only were there too few officers, but a great deal of them were in over their heads. Seeing the main responsibility of the officers in peacetime was training the rank and file, such a deficient officer corps could not assure the training of the troops of a satisfactory quality either. Given these factors it was not truly surprising when the Red Army suffered a fiasco in the Winter War fighting a small but tough Finnish army in 1939-40. The response from the center was predictably radical. The unsettled Soviet armed forces that were already in a state of constant turmoil and flux because of the break-neck expansion (and the purges) would now be also subject to a series of sweeping reforms. The idea was to eliminate the shortcomings of the Red Army that had cost the Soviets in the recent war. However, the program was so radical and so widely conceived it would not be complete until mid 1942. As a consequence when the Germans struck in mid 1941 the Red Army was probably at its most unsettled. Organizationally it was at its nadir and its subsequent performance in 1941 was a reflection of that fact. Mosquito in reading Suvorov first builds up the Red Army of 1941 into an extremely advanced and fine fighting force only to then struggle how come such a force suffered such a massive initial defeat in the war (loosing three million captured in 1941). Suvorov’s answer is a bizarre one. The Red Army was initially thrown back to Moscow because it found itself under assault just a month before it was going to strike westwards itself. But this claim is nonsensical. Was the Soviet Union really going to attack when its infantry had less than 80% of the officers it needed and 70% of its air crews could not fly in difficult weather conditions? The effort of the Soviet Union to bolster and build up the Red Army was eventually going to result in a great and immensely powerful military force, possibly one without an equal. Indeed the Red Army of 1945 was arguably just such power. However, no such Soviet force would materialize before at least mid 1942. Indeed it was precisely the vast ambition of the Soviets and the scale on which they were thinking that worked against them producing a settled and combat ready force in the time Germany would afford them. In actuality it was precisely because Stalin knew his forces were in no way yet ready for war that he refused to believe that Hitler was going to strike. The consequences if the Germans moved east now in 1941 were too difficult to face and so the only thing left to do was pretend this was not a possibility even as everything pointed in this direction. If Hitler was going to strike momentarily then the scale of Red Army build up and reform had been an immense blunder. This could not be the case, so the reality was that Hitler was not going to attack at least for another year. Thus, because of willful self-delusion at the center, the largest military offensive of all times could occur as a complete strategic surprise and fell upon a peacetime Red Army. To better understand the dynamic of the global arms race of the 1930s I suggest reading Cry Havoc: How the Arms Race Drove the World to War from Joseph A. Maiolo. As a brief rebuttal to Suvorov’s hypothesis I suggest the essay Barbarossa June 1941: Who Attacked Whom? from the late John Erickson. To get an impression of the state of the Red Army in mid 1941 I suggest Stumbling Colossus: The Red Army on the Eve or World War from the great David M. Glantz. To read up on the expansion and the state of the Red Army throughout the 1930s and up until the war I suggest the incredibly useful Stalin’s Reluctant Soldiers: A Social History of the Red Army 1925-1941 from Roger R. Reese. To read upon the causes of initial Soviet defeats given the apparent Soviet strengths in a super-condensed form I suggest my essay National Defense in the Great Patriotic War, which is mainly based upon my reading of the last two books as well as a few others. There is certainly a lesson to be learned for libertarians and anarchists from the preparations for the oncoming conflict of the USSR and its performance in the world war. The lesson is that if the Soviets are anything to go by we ideally we do not dare to entrust national defense to the central state. The blunderous performance of the Soviet state meant the Soviet people even in victory nonetheless lost some 25 million people to the war and the cruelty of its enemies. It is a lesson that is extraordinarily damning for the state. But it is also one that can be easily missed if instead of studying real history we fall prey to sensationalist charlatans like Suvorov offering us nonsensical contrarianism for contrarianism’s sake.